RN Constructions (Pvt) Ltd was established in 1996 with a capital of only Rs:500.00 and just three workmen, which today encompasses over 2500 workmen with over 400 professionally qualified staff members and have become today’s one of the leading construction companies in Sri Lanka with strong professional and financial background. Further, the company owns all required machinery equipment and vehicles over 400 units for the use its all construction activities. During its initial stage, the company undertook to construct houses, warehouses, and factories and to date it has completed more than 350 top level construction projects which include the tallest steel building in Sri Lanka, the largest cold room warehouse in Sri Lanka, largest fish processing plant in Sri Lanka, largest oil refinery in Sri Lanka, Largest Bottling Plant in Sri Lanka, Largest Teaching Hospital in Sri Lanka, Largest Super Market in Sri Lanka, two five Star Hotels, the best cinema hall in Sri Lanka, many housing complexes, luxury apartments, factory complexes, processing plants, oil refineries, air craft hangers, commercial complexes, Roads ,Bridges and telecommunication tower Projects etc.. The brilliant rise of the company has been rewarded with the highest accolade in the construction industry as well as in industrial achievement in Sri Lanka. Recognized as most Prestigious grading of M1 Category Construction Company by ICTAD in Year 2005. The recognition of M1 category construction contractor in Sri Lanka qualifies to undertake any project cost without a ceiling level. Upgraded to C1 construction category, the topmost –level of construction in Sri Lanka, recognized by ICTAD in year 2010 and continuing as at today. Winner of Construction Excellence Award – 2006, organized by the Institute of Construction Training and Development (ICTAD), Sri Lanka, for factory Building for ORIT Apparels Lanka (Pvt) Ltd at Seethawaka, as the first Steel Building project to award this in the history of Sri Lanka. Winner of Provincial Bronze Award for Sri Lankan Entrepreneur of the year 2006 ,for “Extra large category” Businessmen in Sri Lanka, organized by Federation of Chamber of Commerce & Industries of Sri Lanka. Winner of National Silver Award for Sri Lankan Entrepreneur of the year 2006, for “Extra large category” Businessmen in Sri Lanka, organized by Federation of Chamber of Commerce & Industries of Sri Lanka. Winner of Provincial Gold Award for Sri Lankan Entrepreneur of the year 2007 ,for “Extra large category” Businessmen in Sri Lanka, organized by Federation of Chamber of Commerce & Industries of Sri Lanka. Winner of National Gold Award for Sri Lankan Entrepreneur of the year 2007, for “Extra large category” Businessmen in Sri Lanka, organized by Federation of Chamber of Commerce & Industries of Sri Lanka. Winner of National Gold Award for “Achiever of Industrial Excellence – 2008” for Large scale category “Service Sector”, organized by the Ceylon National Chamber of Industries of Sri Lanka, as the first company in service sector, awarded by the Gold Award for large category business sector in Sri Lankan history. Finalist of the 3rd Asia Pacific Young Entrepreneur Award-2010, organized by Confederation of Asia-Pacific Chamber of Commerce and industry (CACCI). Winner of Construction Excellence, Merit Award in 2011, organized by Institute for Construction Training and Development (ICTAD). Recognized by all Sri Lankan universities and technical institutions to provide professional training for Engineering, QS and related services, undergraduates and Diploma holders for in-plant training in RN Constructions (Pvt) Ltd. Recognized by the universities in Sri Lanka to provide practical and technical visits to production systems in Amalgamated Building Systems Lanka (Pvt) Ltd as the only recognized professional steel building manufacturing plant in Sri Lanka. Recognized by the Institute of Engineers Sri Lanka for training of graduate engineers for Charter qualification. Recognized by Sri Lanka Viswa Samadi Padanama to Award with “Deshamanya” Honor in year 2008. Winner of Construction Excellence Award in 2015 organized by Construction Industry Development Authority (CIDA), successor of ICTAD for construction of warehouse for Nestle PLC, at Pannala. Winner of Green Excellence Award in 2015 organized by Construction Industry Development Authority (CIDA) for construction of warehouse for Nestle PLC, Pannala. Winner of Construction Excellence Award in 2016 organized by Construction Industry Development Authority (CIDA) for Construction of Proposed Bottling Plant at Munidasa Kumarathunga Mawatha, Seeduwa for Distilleries Company of Sri Lanka PLC. Company started diversification to backward integration to produce all major construction Raw Materials to maintain high quality products at Competitive Price for in house use and to Commercial Market from year 2007. Subsidiary company of RN Constructions (Pvt) Ltd established in year 2006, for manufacturing of standard quality cement Products such as Celluler, Hollow Solid, light weight cement Blocks, Inter lock Paving etc, in order to Sri Lankan Standard Institution and fire Department Standards, to cater in-house requirements & also commercial productions, in 3 fully automated Manufacturing Plants. Subsidiary company of RN Constructions (Pvt) Ltd, Established in year 2007 production and delivery system for cement ready mixed concrete, to cater in-house and commercial requirements, including lab & testing facilities, mixer trucks, pump cars etc, in 5 production unit with over 80 fleet. Subsidiary company of RN Constructions (Pvt) Ltd Established in year 2007 for Design and Manufacturing of modern Pre-fabricated steel buildings; The biggest and most experienced fabrication plant in Sri Lanka, including qualified & experienced engineering designing department, fabrication, delivery and erection department under the supervision of qualified, experienced engineers and technical staff. ABSL is the first branded Steel Building manufacturer in Sri Lanka having exported its buildings to India, Pakistan, Bangladesh, Maldives in addition to the domestic Market. ABSL supplying about 30% of Steel Building requirement of Sri Lankan demand. Subsidiary company of Amalgamated Building Systems Lanka (Pvt) Ltd (ABSL), Established in year 2008, is a total steel solution provider and able to cater with all components produced under one roof, consisting of steel structure, steel roofing/cladding, range of roll formed Galvanized Purling, Gutters, Structural Decking sheet, Louvers, Flashings etc. The State of the Arts latest investment of RN Group, Established in year 2013 as a Board of Investment (BOI) approved company at Export Processing Zone, Mirrijjawila, Hambantota. Consisting of Five manufacturing plants for Pre-Engineered steel buildings, insulated steel sandwich panels, total range of scaffoldings, readymix concrete and cement products. RNI is the first fully automated Pre-Engineered Steel Building Manufacture in Sri Lanka under RNI brand. Also the fully automated insulated Steel PU sandwich panel manufacturing plant is the only automated continuous plant Sri Lanka. RNI‘s total range of scaffolding manufacturing plant is the only production system in Sri Lanka for this range. RN Group of Companies is recognized with ISO 9001-2000 accreditation from 15th July 2008, by DNV (Det Norske Veritas in Netherlands), and Upgraded to ISO 9001:2008 in 29th July 2011. And also upgraded with ISO 9001:2015 and OHSAS 18001:2007 in year 2016. 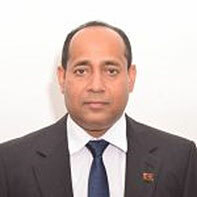 President of South Asians Association for Regional Cooperation (SAARC) Chamber of Commerce & Industry –the apex body of SAARC Countries (Sri Lanka, India, Bangladesh, Pakistan, Nepal, Butan, Maldives and Afganistan) and taking over the presidency of SAARC CCI from March 2018 up to March 2020. President of Federation of Chamber of Commerce and Industry, Sri Lanka (FCCISL), and taking over Presidency of FCCISL from 23rd February 2018 to February 2020. Chairman of Ceylon National Chamber of Industries Sri Lanka (CNCI). Committee Member of Engineering and Architectural Council of University Grants Commission (UGC) of Higher Education Ministry of Sri Lanka.